The comparison of today’s youth to Helaman’s Stripling Warriors doesn’t quite work anymore! But now we have another generation of youth preparing to serve missions. President Monson announced in October 2012 that these youth would be allowed to enter the mission field at a much younger age then missionaries before them. And you know what? They aren’t so much like the Stripling Warriors. I don’t mean to disrespect the Stripling Warriors, but today’s youth do not obey with exactness. No, instead they act before being asked. They do before they are told. They are proactive in their pursuit of pleasing their Heavenly Father and in doing what is right. The youth of today are boldly moving forward in the great cause of our Heavenly Father without waiting for an invitation. If I were to compare the youth of today with a Book of Mormon character, it would be the brother of Jared. The brother of Jared was given an opportunity to prove his worth. The Lord asked him to solve the problem of crossing the ocean in darkness. The brother of Jared approached the Lord in great humility and faith and asked that the Lord to touch the sixteen stones and cause them to glow. His faith was so strong! He not only believed that the Lord could do this, but that the Lord would do this. After the brother of Jared saw the finger of the Lord, he was asked ‘Sawest thou more than this?’ ‘Nay Lord, show thyself unto me’. It was at this point that the brother of Jared was brought into the presence of the Lord and the Lord says, ‘Never have I showed myself unto man…for never has man believed as thou hast’. Now on the surface, this statement simply isn’t true. Adam walked and talked with God. Enoch talked with the Lord face to face. As I visit priesthood quorums on a regular basis, it is easy to see that these are no ordinary youth. The same applies to the young women, I know. One Deacon’s quorum attends the temple every Thursday to perform baptisms for the dead. 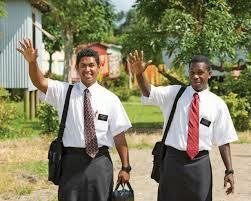 They depart for the temple at 5:00 in the morning. Their quorum president had a conflict and needed to change the time to 4:30 in the morning. No complaints were given, no adult leader made the arrangements. They are just a small group of 12-13 year olds that want to be in the temple, doing the work of the Lord. The youth preparing to serve missions are like the brother of Jared. Never before has an entire generation been permitted to enter the mission field at such a young age. It is as if, like the brother of Jared, the Lord has no choice but to let these youth go immediately after high school. They are the epitome of Doctrine & Covenants 4. They don’t only know and agree to the principles of that section but they live those principles because they are those principles. ‘Many are called but few are chosen’, ‘If ye have desires to serve God ye are called to the work’. These scriptures do not come with age restrictions. Like the brother of Jared, the youth of today are walking through the veil of doubt armed with faith, desire, worthiness, knowledge, and commitment. It is my opinion that the Church is making adjustments to accommodate the youth; the youth are not making adjustments to accommodate the new age limits. The youth are asking to serve, and the church is accommodating. My generation was the ‘marked generation’ and I believe that we are marked. We are marked with a great responsibility. It is our generation that is to lead, to parent, and to teach God’s Greatest Generation ever. Registration is now open for our Youth Church History Tours for Summer 2016. Space is limited and will go quickly. Click here for all the details! Want our latest LDS blog post delivered straight to your email? Simply provide your email in the box at the top left of this page.